Love! Love! Love! These Croskill Kodiak Euro Shams!!! I had seen the Kodiak set at another store, but I did not love the wild bear scene print on the comforter and accent pillows. The shams match my duvet cover exactly, but they were not available to purchase separately. I was soooo excited when I saw them on Overstock! They are really top quality. The stitching is perfect and the design is elegant and attractive. They tie in with my bedding beautifully. The browns have subtle undertones of darker brown and a slight touch of green. I highly recommend them. The European shams of this bedding collection are made of the houndstooth and woven texture pieced together and embellished with a toggle. This sham is trimmed with a covered cord and reverses to the woven texture. 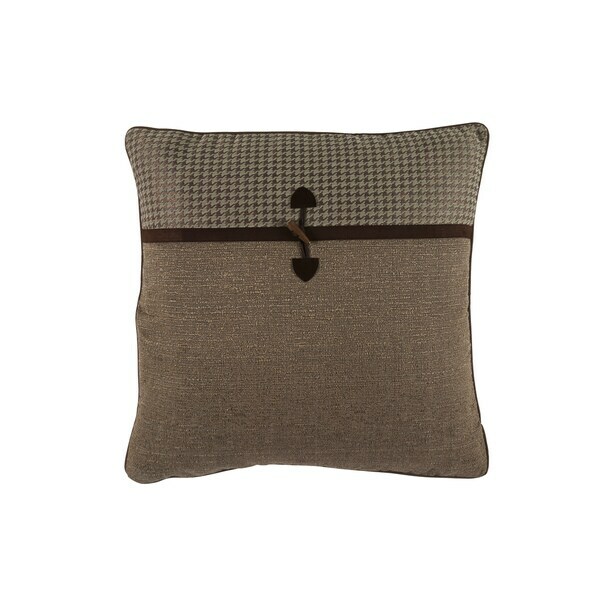 This is a great Euro pillow for the price! Its very detailed looking and sits well on a bed. The coloring is a little greener than brown but I had it on a brown bedset and it wasnt bad looking. It would go well on a greener background as well!